The openHistorian is a back office system designed to efficiently archive SCADA, synchrophasor and other process control data to support real-time grid operations and post-operation analysis. The openHistorian is optimized to store large volumes of time-stamped data quickly and efficiently. The openHistorian2 supports timestamps with up to atto (10-16) second precision -- significantly more precise than GPS time-stamps. The openHistorian2 also implements lossless data compression resulting in small data storage requirements while retaining all the nuances in the data. While lossless compression rates vary based on the nature of the processes monitored, as a rule of thumb about 424 million floating point values are saved per GB of storage. This means, for example, that a SCADA system with 50,000 points to be archived every 2 seconds would fill a 3 TB hard-drive about every 600 days. Or for sample, a synchrophasor data system with 100 PMUs reporting 30 times per second would fill a 3 TB hard drive about every 320 days. The openHistorian2 leverages the GSF SNAPdb Engine - a key/value pair data archival technology developed to significantly improve the performance of both data insertion and data retrieval to enable the openHistorian2 to become the low-latency data layer for real-time applications. The openHistorian2 is a time-series implementation of the SNAPdb engine where the "key" is a tuple of time and measurement ID, and the "value" is the stored data - which consists of both data and its associated flags. The openHistorian2 comes with a high-speed API that interacts with an in-memory cache for low-latency extraction of near real-time data. The hive files produced by the openHistorian are Acid Compliant to create a durable and consistent file structure that is resistant to data corruption. Internally, the data structure is based on a B+ Tree that allows out-of-order data insertion. 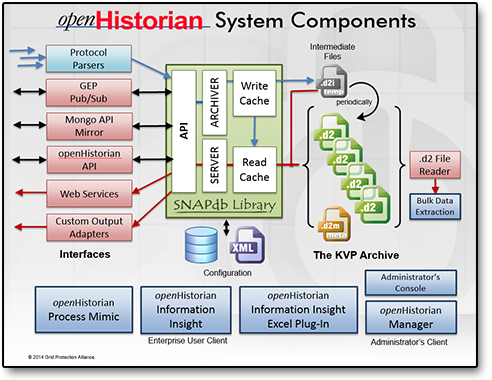 Version 2.4 of the openHistorian was released in January 2018. It enables Grafana Visualizations to be hosted directly by the web server embedded in the openHistorian service significantly simplifying the process of implementing dashboards and other displays from data managed by the openHistorian. The openHistorian2 maintains user security synchronization with Grafana further simplifying use. Version 2.4 also includes other improvements such as the ability to parse and import data directly from COMTRADE files. 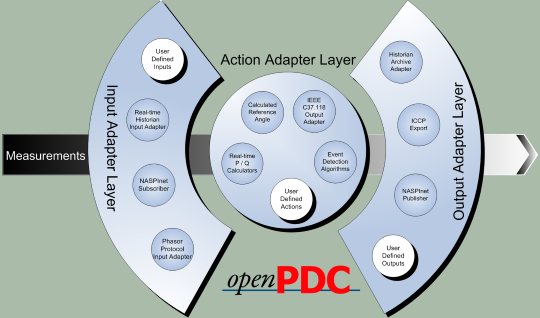 The openPDC is a high-performance data concentrator platform for managing streaming synchrophasor and other time-series data in real-time. The openPDC has been in production use since 2004. It has a proven performance record and it continues to be on a steep improvement curve. Like all GPA products, the openPDC is open source, with no licensing costs so that the system can be easily tested prior to making production implementation commitments. Although the primary purpose of the openPDC is concentration and management of real-time streaming synchrophasors, by having its functionality based on GPA's Time-Series Library the openPDC inherits a modular design that allows it to be classified as a generic event stream processor. 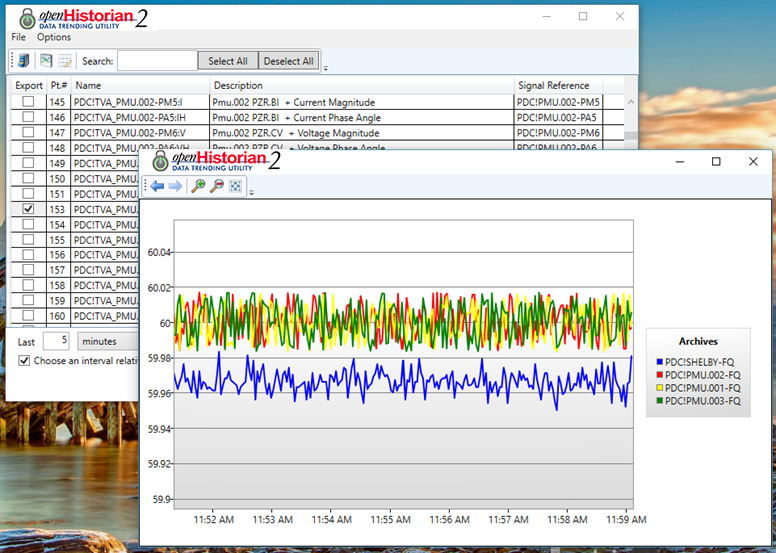 Using the Time-Series Library, the openPDC can be configured to archive to any historian system, however, the system also includes an available built-in historian, the openHistorian, for data archival. 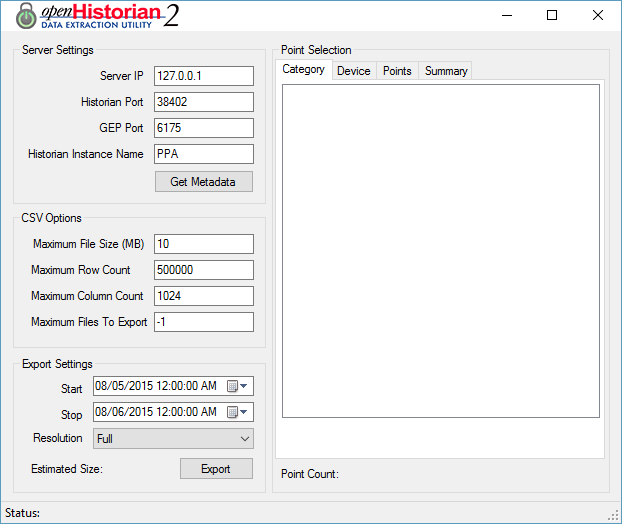 The local historian comes with a visualization and extraction tool, a high-speed local API and web services, all of which can be used to extract and monitor the data being archived in real-time. The files produced by the historian can also be analyzed using Hadoop. With version 2.1 or later, the openPDC can be deployed in POSIX environments as well as on Windows. The openPDC has was originally developed by the Tennessee Valley Authority in 2004 where it was called the SuperPDC. The name was changed to "openPDC" by TVA as the code was posted publicly as open source in 2009. In April of 2010, management of the openPDC source code was transitioned to the Grid Protection Alliance for maintenance and continued development. Since 2010, GPA has released many more new versions of the openPDC [latest openPDC release]. Under the stewardship of GPA, much of the core code of the openPDC was migrated into the Grid Solutions Framework so that the technologies born from the openPDC, such as the Time-Series Library and the Gateway Exchange Protocol could be used, and consequently improved, in other open source products. The substationSBG couples the features of the openPDC and SIEGate to form a purpose-built, high-availability data gateway for use in substations. It is both a substation PDC with a local data historian and a phasor gateway to enable the secure, reliable communication of synchrophasor data from the substation to the control center. It has been extensively tested on fan-less substation computers for both 32 and 64 bit processors using either Windows or Linux operating systems. Phasor data that moves through the substationSBG is persisted locally in a short-term rolling archive. Following any communications outage between the substation and control center, data archived locally by the substationSBG is transmitted (at lower priority than real-time data) back to the control central to ensure that the central archive-of-record is complete. The substationSBG is typically configured to use the Gateway Exchange Protocol (GEP) to transfer data from the substation to other systems. openECA reduces the cost and accelerates the deployment and on-going development of real-time decision support tools, automated control systems and off-line planning systems that incorporate phasor data. openECA was released in the Fall of 2017 following the end of DOE sponsored project DE-OE-778. The openECA platform advances the production deployment of robust and high-availability synchrophasor-based software applications by creating a structured approach to the management of real-time and historical synchrophasor measurements within a platform that can effectively handle the most demanding of synchrophasor data system requirements. The openECA platform leverages the Grid Protection Alliance’s (GPA) existing production-grade open source libraries to create a next-generation interoperable suite of secure services that can be easily integrated with both open source and proprietary analytics with phasor data sources. 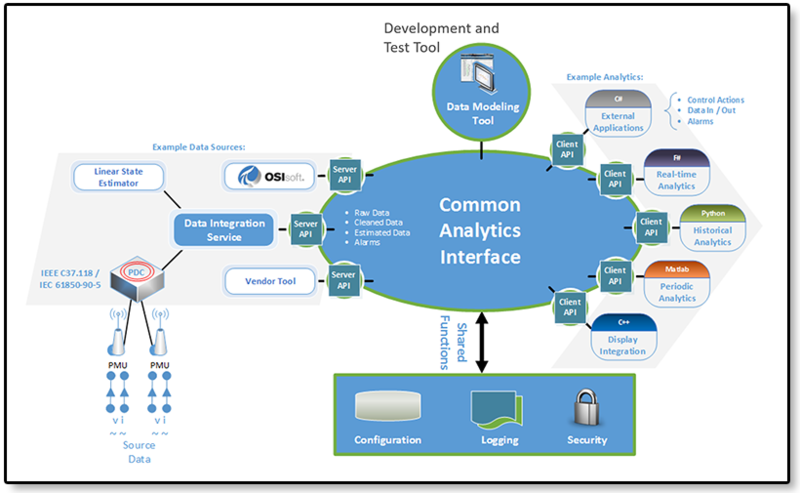 The openECA platform provides a Common Analytics Interface (CAI) for integration of a diverse set of platform analytics along with structured integration of platform configuration, display and storage systems. The platform includes an open-source Linear State Estimator (LSE) as a core component to enable the results from the LSE to be easily incorporated into other openECA analytical components. Provide a robust scalable solution to support phasor data infrastructure of any size anticipated by a North American utility for the next 25 years. PDQTracker is a high-performance, real-time data processing engine designed to raise alarms, track states, store statistics, and generate reports on both the availability and accuracy of streaming synchrophasor data. PDQ Tracker will work with any vendor’s PDC and synchrophasor data infrastructure; measure and automatically produce periodic reports on phasor data completeness and correctness; alarm and/or create emails in real-time if data quality problems are detected. PDQ Tracker was developed with sponsorship from Dominion Virginia Power and Peak RC. The Synchrophasor Stream Splitter is used to generate multiple data streams from a single synchrophasor stream source. This service based application consumes an incoming stream of synchrophasor data (e.g., from a substation with limited bandwidth where sending multiple streams would be impractical) and redistributes the stream as many times as needed. All common synchrophasor protocols are supported (e.g., IEEE C37.118, IEC 61850-90-5, F-NET, SEL Fast Message, Macrodyne and BPA PDCstream). This tool does not disaggregate streams into points - it resends exactly what was received. Manager and console applications can be run remotely - active configuration can be downloaded, edited and uploaded from management tool. Configuration is stored as an XML file. Full support for incoming and outgoing UDP, TCP, IPv6, and IPv4 in all combinations. For TCP proxy point, configuration frames are cached and sent to clients upon request. For UDP rebroadcasts, configuration frames will automatically be sent once per minute unless source connection is already doing this. SIEGate is a security-centric appliance designed from the ground up to reliably exchange the information necessary to support real-time control room operations. SIEGate can exchange measurement data (ID, time, value, quality), alarm and notification data as well as batch or file-based data. As compared to current utility practices, SIEGate significantly improves security while reducing the administrative burden and cost to exchange grid data among control rooms. SIEGate is a pub/sub technology that exchanges data among devices (such as other SIEGate nodes) using GPA's Gateway Exchange Protocol. SIEGate is capable of moving a large and continuously varying set of data at low latency. In addition to the features provided by pub/sub communications, when used to exchange phasor data GEP avoids being encumbered by IEEE C37.118 framesize issues and limitations. A single instance of SIEGate on common hardware can exchange about 5 million measurements points per second. SIEGate was developed with DOE funding under project DE-OE-536. The openXDA (eXtensible Disturbance Analytics) application can automatically processes and analyze event files from disturbance monitoring equipment such as DFRs and power quality monitors. openXDA supports industry standard formats such as COMTRADE and PQDIF as well as many native vendor-specific formats. openXDA runs as a back-office service watching for new event files or changes in event data within meter polling databases. openXDA produces emails and raises alarms based on meter data quality and/or the nature of the system event that triggered the meter. Among the automated analytics included in openXDA are single and doubled-ended fault location and breaker timing. openXDA incorporates configurable logic to detect faults and determine fault location as well as to perform additional disturbance analytics. openXDA also provides an open and easily accessible "data layer" for disturbance and trending data collected by DFRs and PQ monitors. openXDA also includes an API to assist in integration of data with third-party systems. 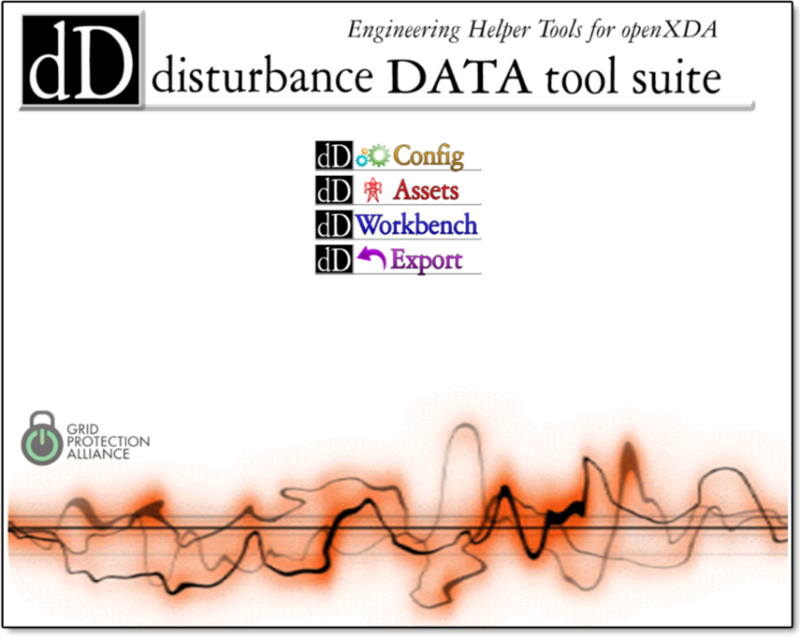 The openXDA database is used to integrate disturbance data with other systems. The openXDA service includes a self-hosted web site where the Disturbance Data Tools (dD Tools) application is hosted. These web-based displays include openXDA and PQ Dashboard configuration pages and well as data editing and visualization pages. dD Tools can be used to configure both openXDA and the Open PQ Dashboard. openXDA can be extended with sandboxed analytics through use of openEAS (Extended Analytic Services for openXDA). 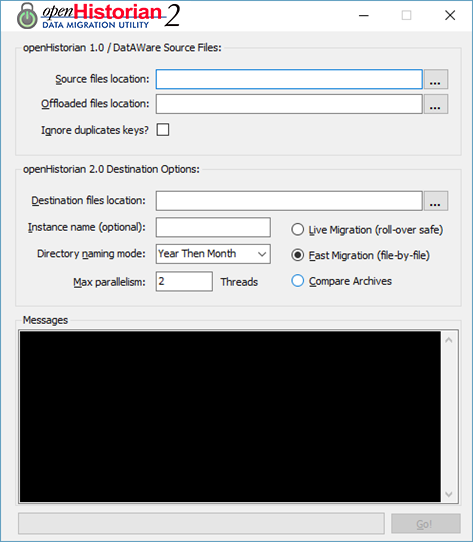 openEAS is a Visual Studio development template for a Windows Service that embeds an externally developed DLL (such as one from MatLab) within a platform that can obtain input data from openXDA and store analytic results to openXDA for display in other tools. Much of the development funding for openXDA has been provided by the Electric Power Research Institute. 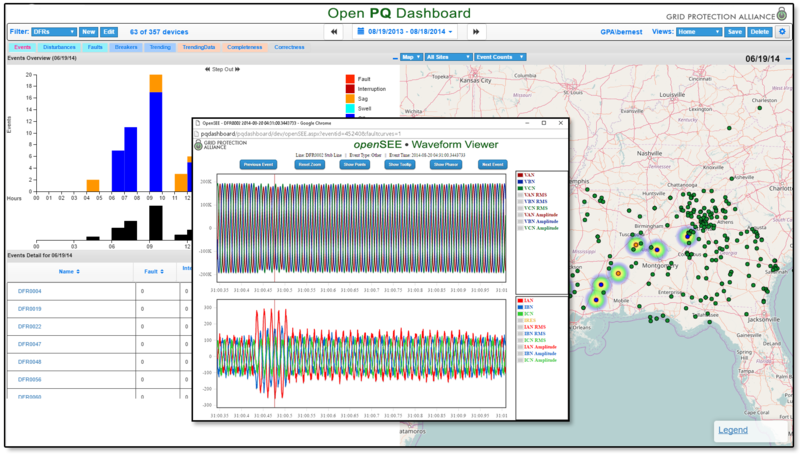 The Open PQ Dashboard is a web-based, enterprise information center for disturbance data. It provides displays to quickly find and understand disturbances on the electric system. 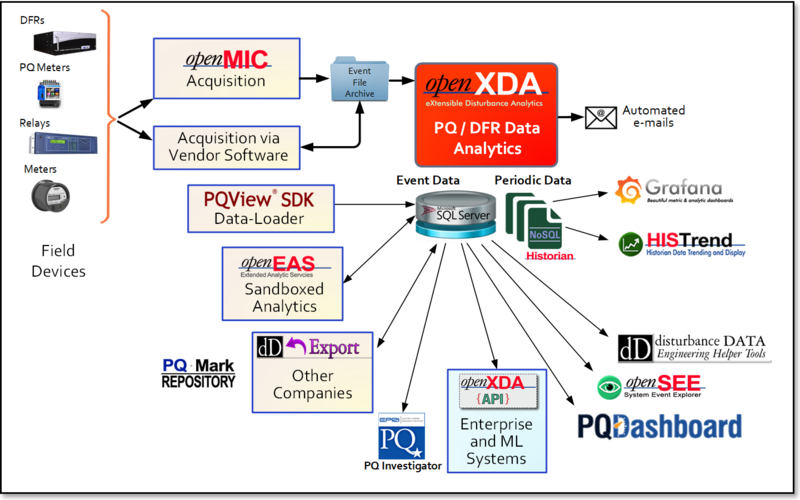 The PQ Dashboard is the visualization layer for data contained in the openXDA database. Open PQ Dashboard displays include the choice of a geospatial map-view or an annunciator panel that provides across-the-room viewing fit for a PQ operations center. Drilling down into from these high-level views provides increasing summary detail information to guide the user down to the specific disturbance waveform of interest. The Dashboard includes a series of tabs that can be individually enabled at either the corporate or user level to provide various dimensions of information derived from disturbance and power quality data. The Dashboard tabs include information on voltage disturbances, faults, breaker operations, data quality, among others. The dashboard can automatically include results from user-developed or third-party analytics as they are added to the openXDA waveform processing engine through openEAS extensions. GPA offers participation in the PQ Dashboard Users Group which meets once per year. Members of the User's Group use this meeting to share implementation experiences and to prioritize PQ Dashboard feature enhancements for the coming year. Much of the development funding for the Open PQ Dashboard has been provided by the Electric Power Research Institute. openSEE is a browser-based waveform display tool that is used to view waveforms in the openXDA database. A link to openSEE can be embedded in both automated and user-created emails so that recipients can quickly access the waveforms that triggered DFR or PQ meter event. openSEE displays two waveforms (typically one for voltage and one for current) from different channels in the same DFR that triggered the event. A phasor data windows is available so that users can easily resolve phase angles. Forward and Back buttons in openSEE enable the user to move to previous and subsequent events from the DFR that recorded the waveform -- or the user can move to previous or subsequent events from any DFR or PQ Meter. This functionality allows the users to quickly see events that happened at about the same time on the power system. openMIC collects data from DFRs and other substation devices. It polls field-devices on a user-defined schedule and organizes the returned data. openMIC is capable of interrogating multiple substation devices simultaneously via IP or Modem (RAS & FTP). Administrators define schedules (including as-fast-as-possible) and specify the output location for data on a device-by-device basis. openMIC is designed for deployment on critical operational networks. openMIC can also poll substation devices using Modbus or DNP3 and push this periodic data from the high-security zone through firewalls to an instance of the openHistorian which is located on enterprise networks. openMIC comes with a browser-based configuration tool that can also be used to display the interrogation history and status of each substation device. PQDIF explorer is a Windows tool that is designed for low-level visualization of data stored in the Power Quality Data Interchange Format (IEEE 1159.3-2003). The PQDIF Explorer is built from GPA's Grid Solutions Framework GSF.PQDIF library which contains the PQDIF parser used in all GPA applications. Low-level visualization to complement other higher-level tools, such as PQDiffractor. Unambiguous discovery of all information in PQDIF files -- including information hidden by higher-level tools. Validation of the output produced by systems that need to write PQDIF files. XML-based configuration that describes all the tags and IDs in the PQDIF standard. Custom tags or IDs that can be added to the XML and will be reflected in the PQDIF Explorer. Also available as a separate nuget package is code that provides a convenient way for .NET developers to parse files saved in PQDIF (IEEE 1159.3-2003) format. Project Alpha is a Visual Studio solution that provides a jump start to develop new products from the GPA's Grid Solutions Framework. Project Alpha is designed to speed development and debugging of new real-time analytics that are created as action adapters in GPA's extensible synchrophasor products, such as the openPDC. In addition, Project Alpha provides the tools for users to develop an independent package for an analytic that contains all the components necessary to deploy the application -- including database scripts, configuration utilities, a manager application, debug host application / release service and an installation utility. Project Alpha allows users to develop and debug their action adapters for the Time-Series Library within a single solution. ARMORE is a substation appliance that performs inspection of network packets and alarms on communications that does not comply with specified ARMORE policy. ARMORE is capable of blocking traffic based on deep inspection of common substation communications protocols, such as DNP3. ARMORE is also capable of encapsulating and encrypting legacy communications and resiliently exchanging this information among ARMORE nodes. Bro, an open source network analysis platform, is the core engine used by ARMORE to inspect network packets. Bro conducts semantic analysis of network traffic in process control and other networks. With Bro integrated within it, ARMORE will provide the ability to collect statistics, inspect relevant traffic, and apply policies to that traffic to help secure critical infrastructure from attackers all while securely communicating both known and unknown protocols to their intended destination via a fault tolerant middle-ware. ARMORE was developed in partnership with the University of Illinois as part of DOE CEDS Project DE-OE-676. Synchrophasor Protocols - The PMU Connection Tester verifies that the data stream from synchrophasor measurement device can be successfully received and parsed. The PMU connection tester supports multiple phasor data protocols including: IEEE C37.118 (Version 1/Draft 7, Draft 6), IEEE 1344, BPA PDCstream, SEL Fast Message, UT-K FNET streaming data protocol, IEC 61850-90-5 and Macrodyne. Gateway Exchange Protocol - The GEP Subscription Tester is a multi-platform graphical application that can be used to verify connectivity to applications that host an implementation of the Gateway Exchange Protocol (GEP) data publisher engine. The GEP subscription tester can currently run on Windows, Mac, Linux and Android devices. GPA encourages and actively supports developers in making contributions to our open source projects. We have published coding guidelines to make the process of incorporating your code go smoothly.